A student was shot Monday morning on the first day of school at a Baltimore County high school, county police said. 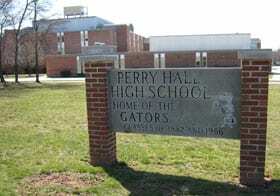 The student was flown to a hospital from Perry Hall High School in Maryland. Details of the student’s condition were not immediately released. A suspect was in custody, according to NBCWashington.com. WJZ-TV showed video of a shirtless male with his hands behind his back being put into a police cruiser. The school was evacuated, with students being escorted to the nearby Perry Hall Shopping Center. U.S. Education Secretary Arne Duncan was at the school on Wednesday to address 800 Baltimore County English teachers, according to The Baltimore Sun. He told the group teachers should earn more and there should be more focus on educating the whole child. This entry was posted on August 27th 2012 at 6:15pm/18:15 and is filed under Live News Column 1. You can follow any responses to this entry through the RSS 2.0 feed.